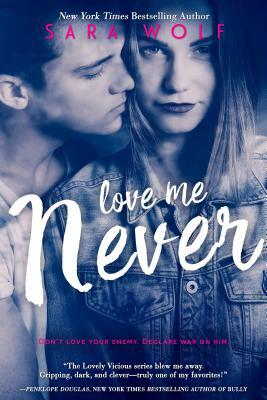 "Love Me Never by Sara Wolf"Life is full of ups and downs and navigating your teenage years can be difficult. It is full of your highest highs but lowest lows and high school is the ultimate battlefield. This book is the classic tale of the strong willed new girl in town who is an outcast plus the bad boy everyone wants but can’t have and how their hate for each other just might become something more. It is done perfectly and with beautifully real characters who show how growth can be painful and messy but possible. The cold exterior we sometimes create is simply the best armor we can find to get through all the hurt buried deep inside and wrapped in scars. The fun dialogue hooked me right away and the pacing of the chapters kept me reading until I was done. I’ve never read a book that so perfectly placed me inside the head of a smart, sarcastic, but troubled teenager and I loved every minute of it." Read the book that Kirkus Review called: "A complex, witty page-turner, ideal for YA fans of scandal and romance." Sara Wolf lives in San Diego, California, where she burns instead of tans. When she isn't pouring her allotted lifeforce into writing, she's reading, accidentally burning houses down whilst baking, or making faces at her highly appreciative cat.